Farmers are always looking for a new way to do things better. This last December, I spent three days in Manchester, NH, at the biannual New England Vegetable and Berry Association conference. I spent the conference listening to other farmers talk about the cool equipment they had purchased and how it had transformed their operation, and despaired to think of how many hundreds of thousands of dollars I would need to invest in order to have all of that equipment. After mulling it over all winter, I realized that I didn’t need to have it all, of course, but there was one piece of equipment that I could buy that would change everything for us: The Kress finger weeder. The brilliant thing about the finger weeder is its rubber “fingers” that go down over the row and pull out tiny weeds while leaving plants that have established firm roots in the soil. We transplant seedlings for many of our crops. If you finger-weed within 5-10 days of planting, the transplanted seedlings will have rooted but the weeds will still be tiny and vulnerable. 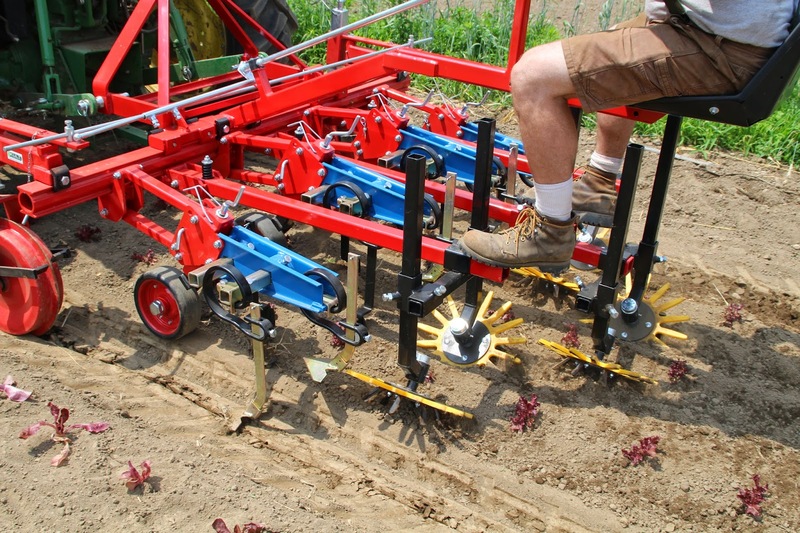 We have other cultivators that can go and take out the weeds in between the rows, but killing weeds in between the plants in the row is always the holy grail of cultivating. Our older systems leave nice rows of crops, but need somebody to come behind with a hoe to clean up in between the plants, which takes an hour and a half per row if it’s done in a timely manner. As behind as we sometimes are in the spring, it can take even longer if you don’t get there in time. 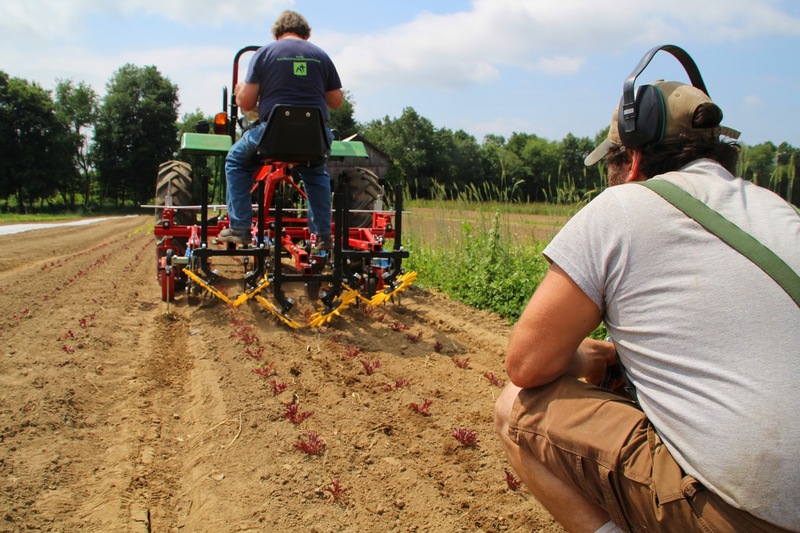 Controlling weeds without herbicide is one of the labor-intensive aspects of organic farming. The finger weeder will help us reduce that intensive labor input. The finger weeder is an American invention that was imported to Europe, where it was enthusiastically adopted by farmers and is now manufactured by the Kress company. Until recently, an American farmer who wanted one had to import it herself from Germany. The Kress company finally has a distributor in the U.S. and just sent over a container-load of cultivators, mostly based on the sales they generated from setting up at the trade show at one conference: the one I attended in Manchester. I spent the winter researching other cultivators, and working on my business plan to see if I could afford the thing, and then applying for a loan to the ever-helpful Common Capital. By the time I called the Kress representative and told him I wanted one, the container was about to ship from Germany, and I was just barely able to order a unit that he could build from the extra parts he had ordered. A local author came to the farm to greet our new finger weeder when it arrived. I had seen him the week before and asked him about his current book project; he told me he had just returned from UC Davis, where people were working on a new cultivator called a finger weeder. “Aha!” I said, “you should come see mine—it will arrive at the farm next Wednesday!” He came and took some pictures of the equipment as it came off the truck, and we had some interesting discussions about agricultural equipment history with Michael, the Kress representative. Apparently after WWII, there was a race between the chemical companies and the tractor companies, both post-war versions of beating swords into plowshares. We had some good technologies in the 1950s for controlling weeds by cultivation with tractors. Unfortunately, the chemical companies won out here, and so many U.S. farms are getting by with using tractors that are fifty or more years old to cultivate weeds. Our Farmall 140 is currently stuck out in the field where we couldn’t get it to start last Thursday and Friday (It’s red, or at least it was when it was new—you may have seen it as you drove by on Pine Street). In Europe, they went much more towards mechanical solutions. That’s why we have to import American technology from Europe now. This last week, we took the finger weeder out, and in a morning, we had cultivated about 2 acres of broccoli, kale, cabbage, lettuce, and winter squash. The finger weeder really does get the weeds in between the plants, just like it’s supposed to. We’ll keep you posted on it’s performance as we use it more, but my initial impression is that this might really be a tool that takes our farm on a big leap forward. Finally, a mechanical success story! Wow, that is so cool! Is it somewhere where we can see it up close when we come pick up shares?